Dr. Dave Chaffey details the need for 'always on' media and how to reach users at each stage within the lifecycle marketing model, filling the gaps by using specific SEO, and social media marketing tactics. One of the biggest changes in marketing over the last decade has been how digital marketing has introduced new, low-cost ways to attract new customers and communicate to existing customers through organic earned and owned sources where paid media spend isn't needed. 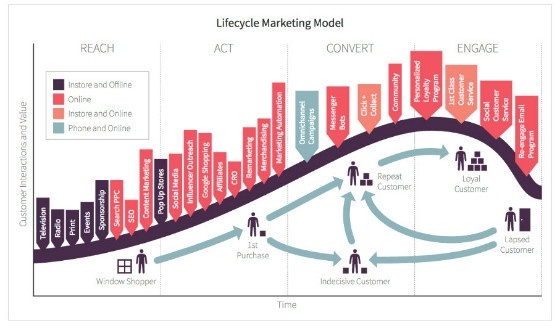 I recently devised this visual of the customer lifecycle to show the many options for 'always-on' media needed for inbound marketing. By thinking through the types of media a business uses through the customer lifecycle you can do a 'gap analysis' of what you use now and those you can use in future. There are different ways to define paid, owned and earned media, but essentially we can use low cost, organic techniques such as using online PR techniques for earned media while owned media includes attracting visitors to a website through organic SEO and organic social media. For many businesses, this has seen over 50% of site visits or sales delivered through these low-cost organic techniques. Of course, low-cost doesn't mean zero cost since SEO and social media need agency or staff input for managing them and creating and distributing content. If you take a look at the typical mix of sales drivers for retailers based on Custora customer data you can see how important these organic channels are (including email marketing). Recently we have seen energetic attempts by the main social network platforms like Facebook, Instagram, LinkedIn, Pinterest and Twitter to monetise further by introducing new paid ad formats and targeting options. At the same time, they have been reducing the organic reach of their pages to encourage marketers to invest in ads. So it has become even more important to review your paid social options. Our recent research with HubSpot on Content Marketing in Europe showed that many marketers are already using these techniques and are finding them effective, particularly on Facebook. Should we target by demographics? Should we target by interest, e.g. people who belong to a particular group on LinkedIn or Facebook? What are our content or promotion offers if we're using paid social for acquisition? What are our core brand messages we need to communicate consistently? Which ad formats will work best for us? Should we use paid social for retargeting (where people have visited our site or social profile)? How do we use retargeting based on intent, for example limiting retargeting to where people have viewed particular content suggesting they are interested in buying? How will we optimise all of these different techniques to improve ROI? Considering how to factor paid social tactics into your digital strategy? Get in touch with our paid search management team for support on a well-rounded paid search strategy that factors in key paid social tactics. Download our free Guide to Running a Best Practice AdWords Audit now, helping you put a solid account structure in place and make the most of your evolving digital marketing strategy.